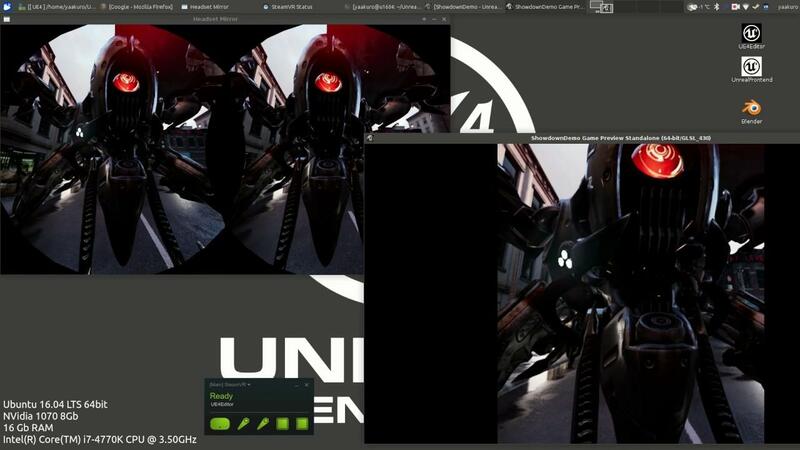 Impressive work by Yaakuro, who has been able to get SteamVR to work with Unreal Engine 4 and it uses OpenGL. Yaakuro sent this to me on Twitter to check out earlier and impressive it is! Quote This is the next progress. The OpenGL implementation works, not super fast but it works. Thx a lot to Valve (Plagman) with supporting me with a real HTC Vive so I could work on the porting with the real thing :D. Soon I will put my changes onto Github. It will be interesting to see what happens with this, since SteamVR on Steam for Linux uses Vulkan. I've never really understood the Vulkan only deal with SteamVR on Linux. Why now allow OpenGL and let the developers decide whatever works? It's not that OpenGL is not allowed, it's just not likely to work fast enough for VR yet. Dave Airlie mentioned that for example radeonsi is missing extensions that would would make it fast. As one of the many thousands (or millions) that isn't planning to jump on the VR bandwagon unless the price drops drastically, I'd like to see Unreal Engine working in Linux properly before they start fiddling with fancy fluff like VR. haagch It's not that OpenGL is not allowed, it's just not likely to work fast enough for VR yet. I suppose that's a valid point, but I mean if we talk about using Nvidias proprietary drivers, wouldn't that be fast enough? ALSO, I personally would have to upgrade my processor, video card, Ram, Hard Drive, heck I'd need an almost entire new system just so I could spend another £700+ to strap the headset on & be able to actually use it. I don't understand why they waste time and resources with this.. Virtual reality will be a success only if we manage to hack the human brain with a non-invasive method, stimulating the parts related to the five senses... And that is science fiction, for now.